Suspended in a cage of glass and wood, forgotten, unnoticed, and unused, yet, when the tiny door opens to let the light in, it still shines. I have not worn my charm bracelet in years. I had all but forgotten it until I took out of my jewelry box today, just to remember a tow-headed girl tripping along in 1/2-inch heels (I have come a long way). 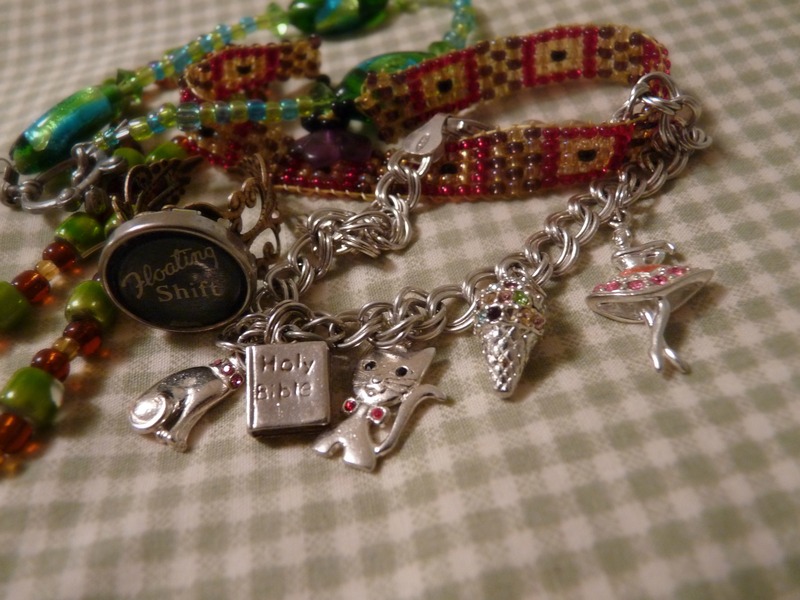 Once upon a time, my charm bracelet was one of my favorite pieces of jewelry. It still has great sentimental value, though I rarely wear it now. I remember the thrill of getting a new charm. I remember admiring the silver bracelet with the glittering pendants. I remember asking Mom to clasp it, because whenever I tried to it would slide off my arm. The tiny ballerina reminds me of my dancing days. I took ballet and jazz for five years at Judy’s Dance Academy. There was a hall covered with pictures of each dancer in her/his costume on the wall. Whenever we arrived early, I scouted mine out. I loved to perform my own (often impromptu) dances for guests. The only memory that the jewel-studded ice cream cone revives is sitting on the steps at Gramma’s house with my cousins, with more blue Dinosaur Crunch ice cream on my face than tongue. Still, this charm was one of my favorite because it was dainty, colorful, and tasteful (savoring the accidental pun). The small cross and Bible remind me of going to church when I was little, clasping the Bible I received upon my graduation into 1st grade, wearing my charm bracelet and small heels that seemed to get stuck in everything. Today, I found myself wishing that I could go back in time, back when the thought of doing schoolwork on Sunday was revolutionary, when mermaids were real and scientists made magic potions (not bug collections and lab reports). I looked in the mirror. Something was missing. Fortunately, I knew how to fix it. As she secured the clasp on my bracelet, Mom mentioned buying some new charms. However, as I walked through the same hall I have walked since I was 6-years-old, I reflected rebelliously that I did not want to add any more charms. Somehow, it doesn’t seem right. Even the cheapest piece of jewelry I own has sentimental value. My Floating Shift ring reminds me of what I aspire to become. Charms are memories. I don’t mind getting new ones, but I cannot add them to the same bracelet. This bracelet belongs to a little dancer with a fondness for cats, who doesn’t know what lies in her future, but loving the charmed life she has.